Chili is the easiest, most nutritious meal I can ever think to create in a pinch. Happily, all the ingredients needed are either bulk/dry or in cans. So, if you stock your shelves just right, you can rest each night knowing you'll always have SOMETHING to make for dinner that is satisfying and healthy. Please excuse the steam clouding this photo. I couldn't wait to eat it. Cook quinoa by mixing the 1/2 cup quinoa with 1 cup water. Bring to a boil. Cover and simmer for about 15 minutes. Set aside. Drain and rinse the kidney beans and corn kernals. Set aside. In a large stock pot over medium-high heat, pour in your olive oil and garlic. Let cook for a couple minutes, stirring occasionally. 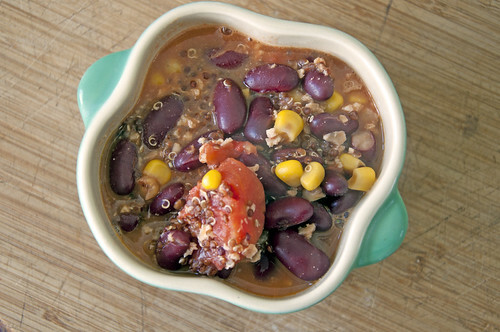 Toss in the kidney beans, corn, tomatoes (juice and all), vegetable broth, quinoa, and TVP. Add the smoked paprika and salt. Bring to a boil. Then cover and let simmer for half an hour. Or less, depending on your time crunch. Squash the tomatoes before serving with the back of a large spoon. Serve with 3-hour Naan or 5-minute Naan. *** This meal tastes great alone or with some melted cheddar. I highly recommend adding the cheddar. More house madness today. We're waiting to hear if our offer has been accepted. I'm. On. Edge. In the meantime, we're clearing out every nook and cranny. Cleaning every crevice. Patching every hole. Etc. I'm already exhausted and we've hardly scratched the surface.